If you came from Rhonda then your in the right place. If you just happened at my place please start at the beginning with Rhonda http://craftingwithblue.blogspot.com/ so you don't miss a thing. 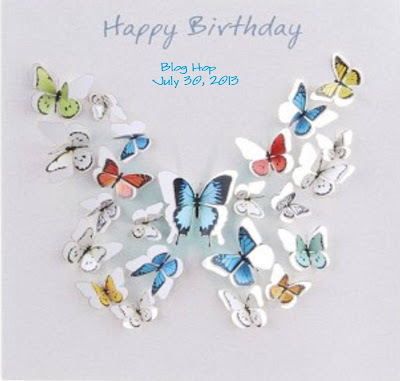 On to my project shall we.. For the Birthday Girl I create an explosion bod full of butterflies. For the box I used American Craft Card Stock, The outer layer is double sided and embossed the other two layers were made from colored Card stock. In a teal like green and a light blue. The patterned paper is from many different sources Walmart new Ki brand, DCWV Mariposa. ATD from Momenta. Most I bought at Tuesday Morning, The ATC cards are a free file from "Ephenera's Vintage Garden" and a few Butterflies printed from my Imagine More Cartridge, Embossed some of the plain Card stock with Swiss Dots and others with the butterfly folder from the cricut embossing and die butterfly kit. The center mat was cut in two sizes from Recollections CS from the CTMH Artist cartridge and stamped with a CTMH sentiment stamp. The following link is to the YouTube video I used to help me create this box. Thanks for stopping by and checking out my work. Please head on over to Edwina; so you can see what they have made. Hope you enjoyed your visit Have a happy crafty day! I am new to crafting and love butterflies. This is a gorgeous piece you've made here. One day I hope to make something as lovely as this. gorgeous. this is something i have never made. awesome job. love it. thanks for joining in with me. This is beautiful!!!!! I love it!!!!! What a lovely explosion box. Love all the pretty accents and soft, muted colors. Wish Rhonda a very Happy B-Day. Janet, my dear friend, your box is absolutely stunning, beautiful, and not to mention, I love the colors!!! Super great job as usual but I wouldn't expect anything less!! !